Behold Visualitätenkabinett Erika! Visit Erika on Vimeo! > Exhausted Creatures take a break from their work at Erika’s animation stand. > Erika’s setup for Out of the Box. 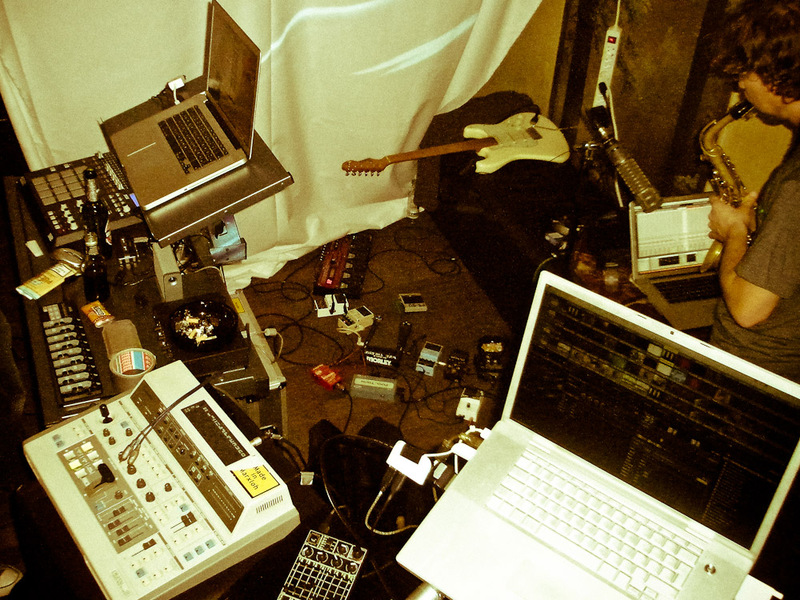 From left to right: 15′ MBP running VDMX, controlled via Akai MPD32 and Korg Nanokontrol, Footage runs from a LaCie LittleBigDisk 7200; original ’80ies Video-Mixer from Panasonic; 17′ MBP running Resolume Avenue, controlled via Faderfox LV1 and Akai LPD8, Footage runs from self-assembled E-SATA-drive equipped with a WD Black Edition. Guitar stuff belongs to Christian Finzel. The brassy woodwind warming up is André Meisner. > Ralf actually is not married. He has cats. > Sven is married. He has a child.